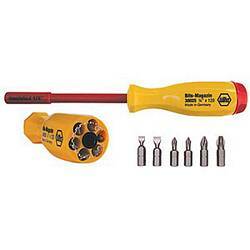 This 1/4" magnetic, hex-drive, bit holder is made in Germany by Wiha Tools. It's hardened steel shaft has durable molded-on insulation to protect against accidental electrical contact. It features magazine-style bit storage in the handle with a see-through rotating bit selector cap. Includes 6.5 and 8.0 slotted bits, #1 and #2 Phillips bits and #1 and #2 square bits.